While praying for his community on the Island of Iona, the Celtic monk St. Columba described his experience as a thin place—a location where heaven and earth seemed only thinly separated. In the same way, God’s kingdom is being realized here on earth with stories of restoration and redemption. Our God moved into the neighborhood, seeking to invite us into his story of reconciliation, and commission us to missionally engage our neighborhoods with the good news of the kingdom. 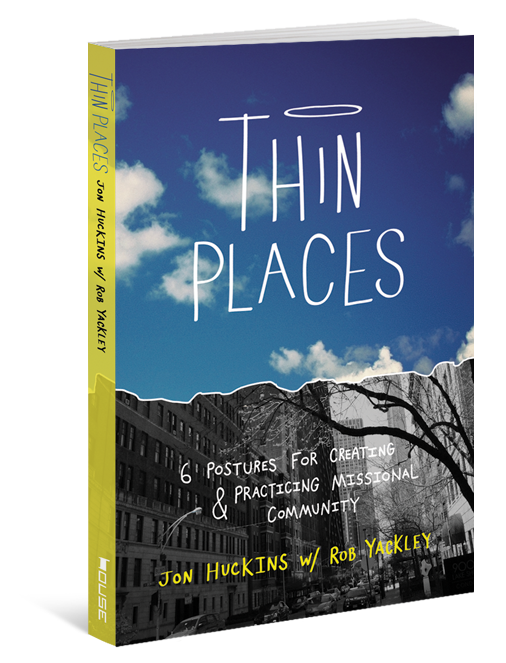 Joining the concepts of monasticism and mission, author Jon Huckins will walk you through six postures of missional formation: listening, submerging, inviting, contending, imagining, and entrusting. As you begin to employ these postures, become apprentices of Jesus who are committed to living in and experiencing the thin places. Through Thin Places, create a fertile soil to commune with God, live in deep community with others, and extend the good news of the kingdom in your local contexts. You do not get to clarity alone. Gaining new understanding of what God desires of his followers comes only in the context of community. No one does community better than the NieuCommunities tribe who value both authentic life change as well as missional impact. For over ten years NieuCommunities has formed people who look, love, act, and live like Jesus. This new book chronicles their journey and gives those passionate to live different, for Christ, hope. I highly recommend this read. ~ Terry Walling, President of Leader Breakthru and Author of Stuck! There is a “come and see” authenticity about NieuCommunities that is so reminiscent of Jesus calling the disciples out of fishing boats on the shore of Lake Galilee I can almost taste the salt air. At the same time, the “come and see” community is balanced by a “go and do” mission that gives me hope for inside-out change in neighborhoods in the global city. At a time when many are talking about missional communities, NieuCommunities quietly and expertly goes about doing it—forming young men and women and transforming neighborhoods. The vitality of NieuCommunities is less about what is being said than what is being lived. You’ll want to read this book and listen to their story. ~John Hayes, founder of innerCHANGE and Author of Submerge and Living Deep in a Shallow World. “As the Church is rediscovering its missional ethos within a post-Christian culture that has been saturated with religious consumerism and nominal commitment, we have needed communities that could model a new path forward for us. NieuCommunities has done just that and I excitedly anticipate a book that captures their journey.” ~Kyle Osland, Pastor at Icon Church, San Diego.